How far, how fast? It's not much more than a couple of years ago that Matt Houghton dropped off a sample of the first ever Ramjet at Crafty Towers. Later that evening, after a planning meeting with members of the Good Beer Week team, a bottle was cracked. Someone arriving late was handed a glass without knowing what it was. "Wow. What's that? That's amazing; I could put away a pint of that," she said. "It's a new imperial stout from Boatrocker. It's more than 10 percent." 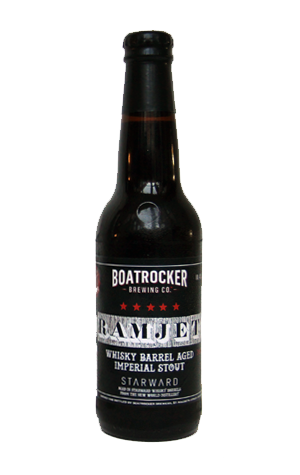 Fast forward not very far and April 9 was the date for the first Ramjet Day, a sold out event that saw 100 people pay $150 each for the pleasure of being at the launch of the beer at Boatrocker's still relatively new Barrel Room. There, they sampled all manner of Ramjet variants and Ramjet-inspired and infused food and walked away with more Ramjet and associated goodies. Which means that the latest vintage is now out and about. It's bigger than in previous years – 11.4 percent ABV – and again arrives having spent time in former Starward whisky barrels from Melbourne's New World Distillery. As you'd expect, once it hits your glass it's thick as, black as and rich as, with dense, fudge like chocolate aromas leading the way, backed up by hints of leather, coffee and vanilla. The time spent in whisky barrels becomes more apparent as it warms: oak and spicy booze pop up to say hi, as does a drying, almost tannic, roasty edge. One assumes this may well age even better than previous vintages, if you can resist, and should ensure the fledgling legend of the Ramjet continues to grow.